I love Miwa Shirow's artwork and when i saw this scan i decided to use it for my next project. To start off the line art took most of my time on this project especially the speakers testing my patience. On the colour theme for the wall, on the original scan i thought it was over the top with bright aqua so i decided to make the aqua darker with a mix of blue. Since the original didn't have a lot of detail mainly on Miku i added the extra details to her hair and used gradients for most of the details. Final touches was the gradient background as the vector was taking up most of the wall and didn't want it to feel too crowded and sparkles. Love how you made the changes, looks much better now. And on top of that it's Miku again. 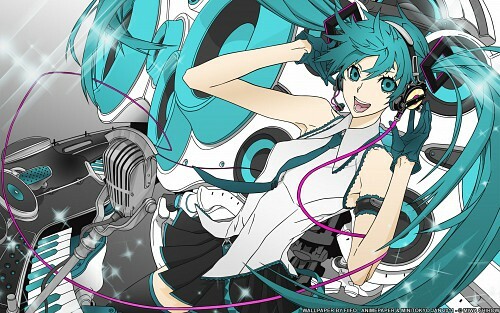 Hooray for Miku fever lol Good job, it's a fav. GREAT WALLPAPERS! AND GREAT QUALITY! job vectoring it. I like the sharp outlines + the color shadings. I am in love with music now~! LOL! This is really awesome! Love how its layed out! Haha very cool and retro I like it. You've done very well on reconstructing the image and making it a nicer color of blue! Mikuuuu >w<! omg i love her!